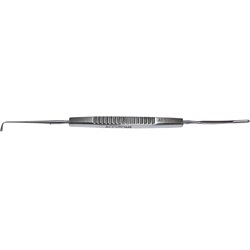 Double ended, 2mm wide x 24mm long spatula tip, malleable, 3mm wide hooked tip, 90 degree angle. Flat handle. Overall length: 124mm.